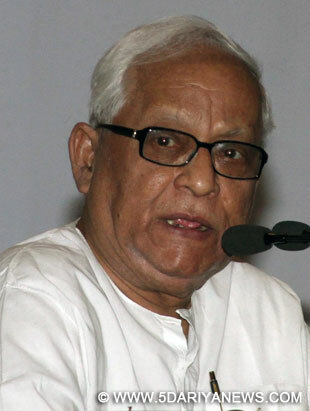 Taking a jibe at Prime Minister Narendra Modi for raising railway fares, former West Bengal chief minister Buddhadeb Bhattacharjee Friday said the "strong man" has given his "first dictum" to the poor that they have to stay away from train rides. "The railway fare, and freights have gone up. The strong man, the lion king now in power in Delhi has given his first dictum to the poor by steeply raising train fares. The dictum is the poor have to stay away from train rides," Bhattacharjee, also a CPI-M politburo member, said at a Left Front demonstration here.He iterated that the Left "had no doubts all along about the path the Bharatiya Janata Party led National Democratic Alliance government of Modi would chart out. "We knew all along that they will tread this path," he said, at the end of the three-day demonstration staged by the Left Front against "atrocities" committed on their cadres and leaders by state's ruling Trinamool Congress.Bhattacharjee said the state had lapsed into "anarchy", with the Trinamool using the police and the administration to "liquidate all opposition" in West Bengal. "Their aim is to ensure there is no opposition force in the state. They think they can silence us through violence which is continuing for the last three years. They wouldn't have been able to do this without the aid of the administration and the police," said the Communist Party of India-Marxist veteran. "Will we bow down, surrender? No, never. We will go to the extent that we have to. People are telling us to hit the streets as the situation is becoming unbearable for them. We have to build up a strong movement against this," he added. Ridiculing the Trinamool, he said the party has 34 Lok Sabha members. "There is a player, some artists, some former and present film actors. But why will they speak about price rise? They have such huge income. Are they bothered about the increase in prices of rice and potatoes? They have crores of money. "Bhattacharjee said the BJP, which has increased its vote percentage in the state, was trying to capture the opposition space from the Left. "In some areas, the RSS is intensifying its strength. We have to hit the road to stop them."